We pride ourselves on having very transparent pricing for our products as we want our customers to enjoy the photo and viewing sessions without worry about pressure selling or how much photographs chosen would cost. You can choose to come to our beautiful custom designed studio where we can use a range of backgrounds and you can change your clothes and achieve several different looks to choose from. If you would prefer the portrait to be at home or at an outdoor location of your choice, then these options are both available. We offer a Newborn portrait service in the studio for babies 7 -14 days. Sandra is fully trained in this specialist portrait sessions and takes beautiful images. The studio will be at the correct temperature, the correct music/white noise will be played, and a wide range of wraps and blankets are available. Our changing room has a proper baby changing station. These portraits are up to 3 hours to allow time to get the baby settled and sleeping, for feeding, and nappy and clothing changes. We frequently run special promotions with Groupon or have other special options so please phone or email for the best offer available. Our Desktop Products are the perfect way to display your photography within your home. We have given details of three of the most popular finishes but there many others and you can see samples at the studio. Our prints are presented in attractive frame mouldings and are presented with a beautiful satin finish heat-seal offering the perfect solution to displaying your favourite images. The Box frame is usually used as wall decor but it is very effective as a desktop product and looks great with the 2 inch deep profile, available in 9 different moulding colours. It is a great alternative to the more traditional framed desk print. It is supplied in a presentation box and makes a great gift. The ultimate desktop presentation, the Glacier Block is a stylish and eye catching way to display your photographs.The “designer” block gives a depth and style to your imagery, setting it apart from other products. The print is mounted to the back of the 30mm acrylic block which gives a prism effect, allowing you to view the image in different ways from many angles. The Glacier Block comes in various sizes and is beautifully presented in an attractive black presentation box. We prefer to supply finished products but we do realise that you may require something simpler or for your own frames etc. so therefore we offer print packs where you can choose a selection of print sizes or have any custom size prepared. The styles and options available are extensive and we can provide something suitable to enhance any decor. 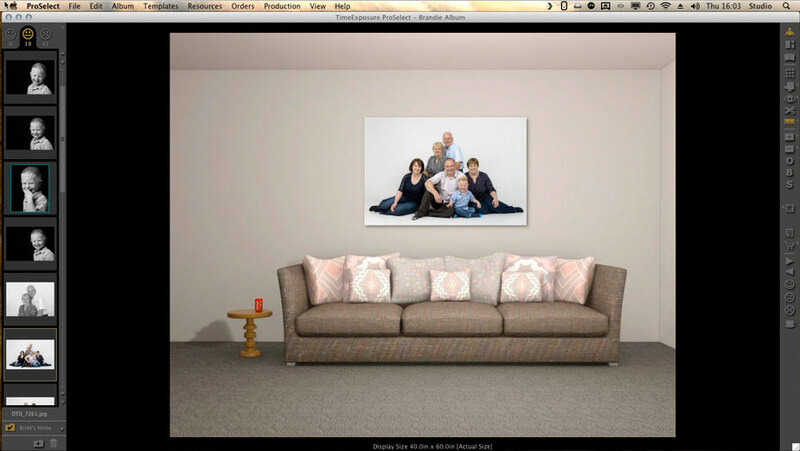 We have a unique system to let you preview you how a wall portrait will look in your home. If you take a photograph of your wall on a phone or digital camera and then measure anything in the photograph and send this to us by email, we can show you exactly how different sizes of wall portrait will look on your wall. If you choose a flush finished print, we will use a choice of beautiful satin or gloss finishes that do not require glass. If you decide to have your print presented in a single or double mount (Cut mounts are available in 12 colours in both single and double formats) we use high-visibility acrylic to finish your framed prints, giving the same clarity and definition as glass, but with added durability and longevity. The Canvas wrap is a firm favourite for our clients as it looks fantastic in any decor – traditional or contemporary – There is a choice of 25mm or 45mm depth, and in many size options up to 2metres or larger. it will sit perfectly on any wall in any room. We are aware that canvas prints are widely available on the high street but having looked at these, the quality is often very disapointing. Our Canvas Wraps are hand made using the best materials and traditional methods employed by true craftsmen. The Box Frame offers a contemporary option for your photography in a choice of nine moulding colours, and several beautiful finishes. It is a striking alternative to a traditional framed print and a very popular option. The frame moulding sits flush against the wall, is of the highest quality and is available in black, white, silver, gunmetal, bronze, gold, oak, beech, and wenge. The beautifully finished framed images are carefully packaged and delivered in a presentation box. We have many other finishes including metals, acrylics, fine art, fine art, and our custom designed Noir and Blanc products. We have lots of great package prices so when you buy more than one product, you make sizeable savings e.g. buy a wall portrait and get a disk with your images at ½ price! We usually have special offers on at least some of our products. FotoBLOKS are a stylish, contemporary frame that uses a 15mm acrylic blok to hold your photograph in place, within a 10mm high gloss heavy weight acrylic frame. Once inserted the blok gives your image a 3D effect. The high gloss finish, the 3d effect , and the selection of images make these a beautiful addition to any home. A great aspect to these is that once you have purchased this wall display item, it is very simple and inexpensive to change the images. Frames are available in Black, White and Frosted White and a wide range of different print combinations. All frames have rear mounted wall fixings and are supplied with separate cams which can be rotated to ensure that your frame is level. Where appropriate, fittings are fixed so that the frame can be hung either portrait or landscape. FotoSLOTS and Premium FotoSLOTS are a creative, yet affordable way of displaying your prints. As the name implies, your images are inserted into acrylic pockets which are mounted on to a 3mm or 5mm acrylic frame. These come in a range of sizes and 10 colours. Premium Fotoslots use the same system as the standard Fotoslots, whereby you slot your image into an acrylic pocket, but these are mounted on to a sturdier 5mm frame and are available in a selection of twelve colours.